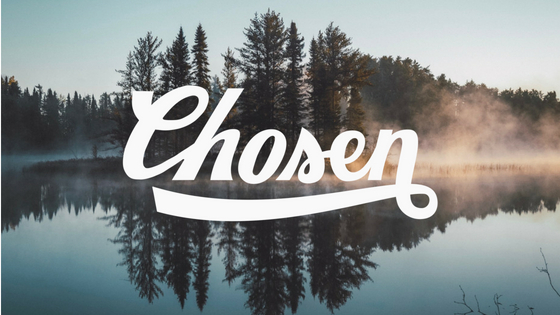 To be chosen is a powerful idea that empowers and let's you know that you belong. That's exactly what we want our child to know and feel. We want him/her to know that they were always wanted and chosen. That he/she is so special and cherished. What better word to love and focus on than chosen? It's one of the best words that describes how God feels about us as individuals. God's love is so great and He chose to make the ultimate sacrifice and chooses to forgive us and love us unconditionally each day. It was God's designed plan and He chose to see it through; the ultimate picture of love. We are God's sons and daughters, adopted into his family and loved as his own. He arranged it to be this way since the beginning of time. I wept as I read through this passage of scripture seeing it with fresh eyes about myself and our future kiddo. Adoption means I take you in as my own and I take care of you. You are chosen. You are mine. We loved what chosen means so much that we put it on a t-shirt. 2. Help us bring Baby Campbell home. There are 2 different t-shirt designs for you to pick from (or get both!). Each design has different styles and color options. Pick the one that makes you smile the biggest. We hope that you love these shirts as much as we do! This is a shirt with a front and back design and it comes in 4 different colors: black, cardinal, olive, and stone gray. This shirt is front only in a lovely script. You've got more options for this one as it comes in a t-shirt, tank top, and youth sizes (t-shirt only). Lot's of colors to choose from! The most popular choice of t-shirt so far has been Ice Blue. I can see why! If this post encourages you or you've already purchased one of our t-shirts, will you share this on your social media accounts? Every share is valuable and we'll owe you forever!